A well is the most common way to obtain groundwater for household use. A well is basically a hole in the ground, held open by a pipe (or casing) that extends to an aquifer. A pump draws water from the aquifer for distribution through the plumbing system. The depth to which wells are constructed is determined by factors such as 1) depth to groundwater, 2) the groundwater quality, and 3) the geologic conditions at the well site. Permits for well drilling are ALWAYS required here on the Delmarva Peninsula. Please contact us regarding the specifics of permitting requirements for your state. A well must be located so that it meets the minimum isolation distances (also known as “setback” or “separation” distances) required by your particular state. These distances are between the well and utilities, buildings, and potential sources of contamination on your property or neighboring properties. Before construction begins, the best location on the property should be identified by considering the location of proposed or existing buildings, septic systems, buried gas or power lines, future building and construction and any other potential sources of contamination. vented and have a cap that is weatherproof and insect-proof. If a well pumps water from a sand or gravel aquifer, a well screen is usually attached to the bottom of the casing. The screen is a sieve or strainer-like cylinder that extends into the aquifer and allows water to move through it, while preventing sand and gravel from entering the well. The screen openings — or slot size — are selected by determining the size of the sand or gravel particles comprising the aquifer. PVC screens are used here on the Peninsula and are typically 10 feet in length for residential wells. An envelope of sand or gravel — called a gravel pack or a filter pack — may be placed outside the well screen, between the screen and the bore hole wall. The filter pack keeps fine sediment from entering the screen and also promotes the movement of water into the well. The rotary drilling method produces a bore hole which is larger in diameter than the casing. The space between the outside of the well casing and the bore hole wall is called the annular space. After the well casing has been placed in the bore hole, it is necessary to fill the annular space to keep surface water and other contaminants from entering the well. The material used to fill this annular space is called grout, a specific mixture of water and cement, or water and “bentonite” clay, and sometimes other permitted additives such as sand. Grout must be pumped in from the bottom of the well upward, to assure a complete seal around the casing. The usual method is to insert a ¾- to 1¼-inch diameter pipe (known as a grout pipe or tremie pipe) down to the bottom of the space between the well casing and the bore hole. The grout is then pumped in until it comes to the ground surface. The grout must not be poured from the surface. All rotary-drilled wells must be grouted from a required minimum depth to the surface or to the base of the pitless adapter or unit, which is shown in the illustration. After a well is drilled, it is necessary to remove drilling mud, cuttings, and loose sediment from the bottom of the well and from around the screen. This process, which promotes the movement of water into the well, is called development. A number of techniques can be used to develop a well, such as injecting air or water into the well, or water can be pumped out of the well at higher than normal rates. A water system is needed to pump the water out of the well to the surface and deliver it under pressure to the place where you will be using it. A typical home water system consists of a pump, a pitless adapter or unit, and a pressure storage tank and control devices that allow the system to operate automatically. A pump is used to push or lift water from the well into your household plumbing. The correct size of pump and pump motor depends on the well diameter, the water level in the well, the number of plumbing fixtures, the amount of water use, and the peak water demand. Peak demand usually occurs during the morning and evening hours. Pumps are rated in gallons per minute (gpm) and pump motors are rated in horsepower (hp). A typical pump for domestic use might have a 10 gpm pump with a ½ hp motor. Special water needs — such as for irrigation, heat pumps, or livestock — can increase peak demand and require a larger pump. A submersible pump, which is the type most often used in drilled wells, consists of a pump and motor unit, typically 3½ inches in diameter and 2 to 3 feet long. The pump is placed directly into a 4" or larger well, below the water level. Jet pumps are most often used on wells that are 4 inches or less in diameter, such as drive-point or other shallow wells. 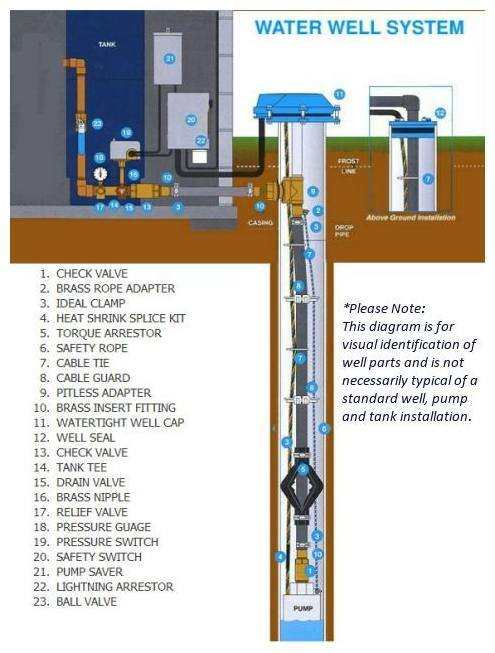 The pump may be located on top of the well — or it may be offset from the well in a pump house, and connected to the well with piping. Jet pumps typically have a lower operating pressure and a lower water yield than submersible pumps. Jet pumps operate by forcing water through a jet or venturi— a narrow, cone-shaped device which creates a partial vacuum (suction) and draws water from the well into the pumping system. Shallow well jet pumps — which are used where the water is less than 25 feet below the surface — have the jet located in the pump itself. For deeper wells, the jet is located inside the well below the water level. As the name implies, a pressure tank contains water under pressure. As water is pumped into the tank, it compresses the air in the tank until the pressure reaches a preset level — typically from 40 to 60 pounds per square inch (psi) — which automatically shuts off the pump. When a faucet is opened, the air pressure in the tank forces water through the pipes until the pressure drops to another preset level — usually from 20 to 40 psi — which starts the pump again. A pressure switch starts and stops the pump at the preset pressure levels, and allows the system to work automatically. When constructing new additions to your home, adding new buildings, or altering waste systems or chemical storage facilities, be sure to maintain proper isolation distances required by your state. When landscaping your yard, keep the top of the well at least 1 foot above the soil surface. This will help keep insects, dirt, and other contaminants from entering your well. Do not pile snow, leaves, or other materials around the well. Slope the soil away from the well casing to promote proper drainage. Neither Delaware, Maryland nor Virginia allow a well to be buried. Be careful when working around your well. Avoid damaging the well casing, which could jeopardize the sanitary condition of your well. When working with hazardous chemicals like paint, fertilizer, pesticides, and motor oil, keep them away from your well.